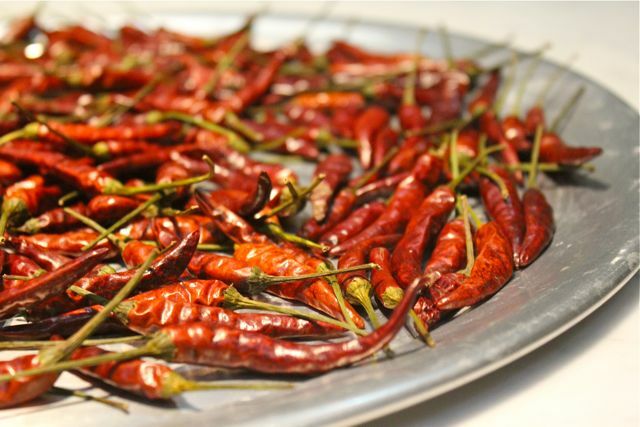 These dried bird’s eye chiles are wickedly easy to make. And homemade ones are just so fresh and fragrant compared to most store bought dried chiles that have most likely been on the shelves for months on end. I decided to try and make my own dried chiles for the first time because I impulsively purchased two kilos(!) 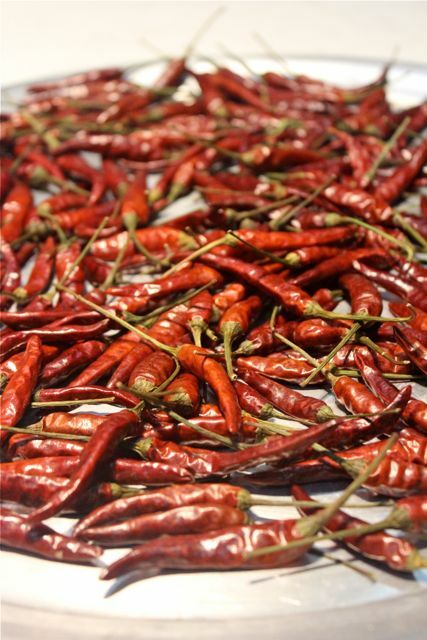 of fresh chiles at the Nasugbu market when the vendor asked on PHP40 a kilo for the most amazing looking chiles. It was a clear day with sweltering sunlight, so I placed some of the chiles in an old pan which has lost its tin layer and lay them out on our hot driveway in direct sunlight. I figured I could dry these out in a day or two at most… Until the clouds rapidly turned grey a couple of hours later and it started to rain. So I stuck the chilies on a pizza pan and put them into an oven set at 200F for about 4 hours and the bright red chilies turned a wonderfully rich burgundy color, and the aroma in the kitchen was intoxicating! These should last several months but I suspect they are best used within a month or two of making them as they have the potency and fragrance that is the single best advantage of making your own. You can add these to stews, chop them up and add them to any dish requiring a bit of zing, or you can roughly blitz them in a blender or food processor some homemade dried chile flakes. if you blitz them, would you need to remove the green stalks? I’ve recently invested in an electric food-dryer which is letting me dry all kinds of things. For instance dried lemons are just amazingly useful for all kinds of things (e.g. pulverise them and add a pinch to flour when preparing to fry fish). Off-topic (sorry we are all asking questions) but does the reference to ‘an old pan which has lost its tin layer’ mean it’s hard/impossible to get them re-tinned in The Philippines? MM, I thought you had another lapse but I went back to your post on chili oil/chili flakes and you mentioned buying dried chilis and not drying them yourself. 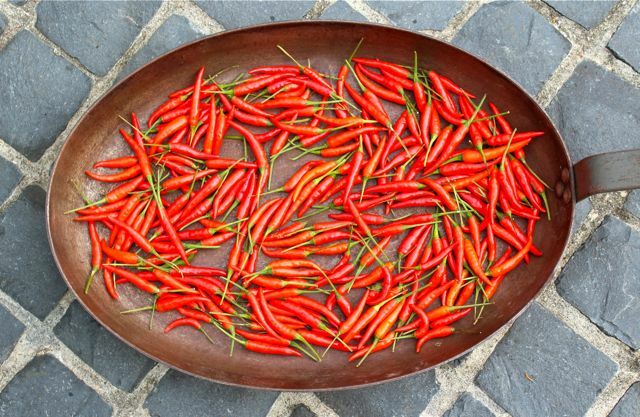 So, the one you sell at Zubuchon where from store bought dried chilis? @Ken _L: when you dry lemons,do you use only the rind/peel or dry the whole fruit? Betchay, the ones at Zubuchon are native siling labuyo, and the crew dry them on our own property, under very hot sun. So we do make the ones we have sold in the past. And we do make the ones used in all of our dishes that have chiles. So I have seen it done, but have never literally done them myself until this post. :) The native chiles are smaller and for some reason, a little less fragrant than these particular ones in this post. She was upset about the idea of dedicating a pan just for frying fish alone. Obviously, single use implements are anathema to her world view. She’ll find it hard to keep kosher. Betchay I dry the whole lemon – slice across the fruit in slices about 5mm wide, although there’s no need to be too exact. The flesh dehydrates to practically nothing. It’s important to keep drying until they are really crisp and brittle, unless you can keep them in the ref. It’s amazing how they reconstitute into thick supple rings if they are slow-cooked. I’ve seen “sun-dried” tomatoes done in the oven, never thought about using the same process for chillis. Genius. MarketManila Tote Bags Are Done!! !